Happy holidays are here again, especially in the Nashville area. The city’s booming economy bodes well for those who own and operate party spots, big and small, new and trendy, or classic and traditional. In recent years, businesses have tended to shy away from the big corporate bash for clients, customers or employees as a cost-cutting measure. Not this year. Venues are becoming booked up already to accommodate the holiday celebrations at the end of the year and for New Year’s Eve, an event that usually sells out Nashville’s hotel rooms and brings in hundreds of thousands guests, according to the Nashville Convention & Visitors Corp.
Take The Bedford as one example. The Sidco Drive venue is only a month old, although its history goes all the way back to the 1970s when it was Daryl’s. Pam Cherry, marketing coordinator for the space, says the newly-created party venue has almost 25 bookings scheduled through the end of the year. New venues are getting their share of the market as are the many downtown hotels and restaurants and, of course, landmark locations such as the Country Music Hall of Fame. Booking less familiar spots like art galleries and music and video studios is a trend that’s gaining in popularity among Nashville’s party crowd. The Bedford may be new on the scene, but it has a size advantage that corporate players may need for a celebration. The venue can accommodate 400 seated, 330 with the DJ and dance floor and 600 for a mix and mingle. Plus, there are 300 free parking places for guests. 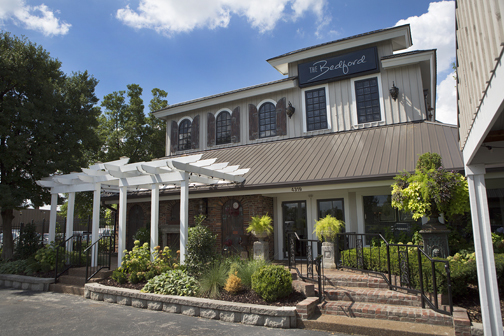 The Bedford location was sold in 2002, and it became the home of home décor and interior design space ReCreations. 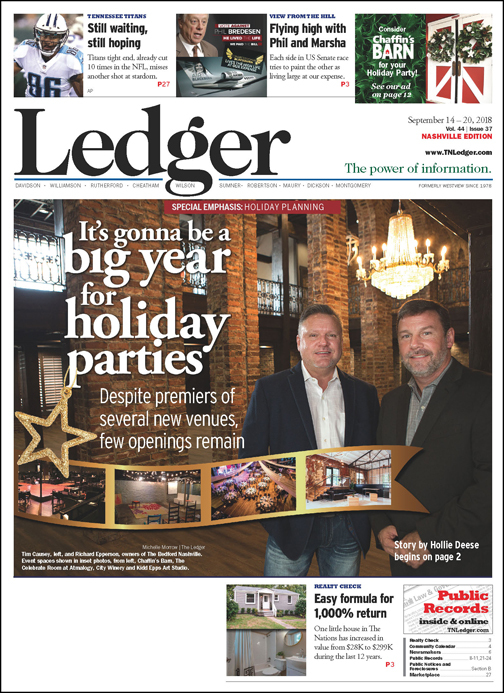 And when owners Tim Causey and Richard Epperson consolidated that space on Melrose in 2017, the building became The Bedford Event Venue. Cherry says there are more than 200 venues in Middle Tennessee, but she and the owners are confident in their potential success because of the size. 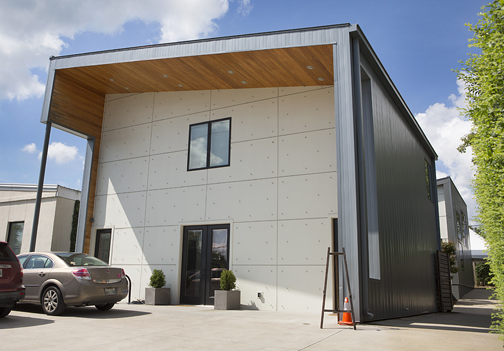 Exterior of The Bedford event venue at 4319 Sidco Drive in Nashville. Below, one of three interior levels. For anyone who wants to host an event on Monday through Thursday between now and Dec. 31st of 2018, Cherry says they’ll get a free Monday through Thursday six-hour or 12-hour rental free, a buy one, get one free deal. Noelle is a 224-room, 13-story boutique hotel on a booming 4th Avenue filled with more boutique hotels. Noelle opened December 21, 2017, and is owned by Rockbridge and operated by Makeready. 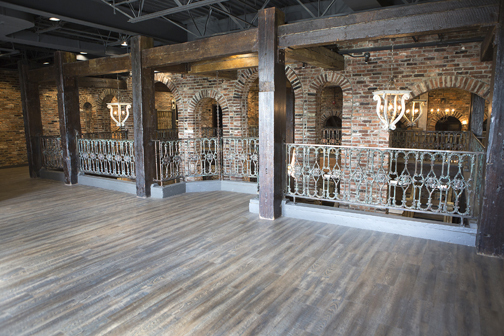 Stephanie Gray, marketing manager for Noelle, notes the hotel’s Saidee Gallery ballroom features large arching windows, beautiful wood flooring and intricate millwork. 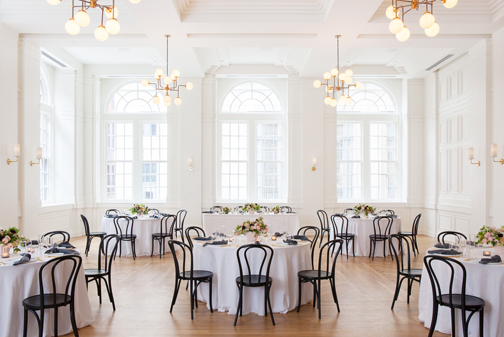 The ballroom has seen every kind of configuration of events like dinners, luncheons and public speaking engagements as well as weddings, baby showers and pop-up retail events. And lately, more and more calls about holiday parties are coming in. “We also have a lot of unique spaces around the hotel that are being used for different types of groups and breakout functions and special events,” Gray says. “We have the bars and the restaurant, and we’ve even had events in the penthouse or different guest rooms. Saidee Gallery can accommodate 120 for a sit-down meal and 140 for a reception, and there are still some dates available for holiday parties. But Gray says their event bookings continue to build, especially among those who seek a sense of history and place. Archives on the hotel’s mezzanine level accommodated up to 40 for a dinner or reception. “The historic elements of the hotel bring a sense of nostalgia to the holidays,” adds Gray, stating that the Trade Room is ideal for holiday receptions with original Tennessee marble walls, terrazzo flooring and crown molding. The hotel was originally the Art Deco lodging house, Noel Place Hotel, in the 1930s and operated as a hotel until the 1970s when it became a financial building and offices. It reopened as Noelle, with a nod to its past. Architects Feltus Hawkins Design and Nick Dryden of Dryden Architecture and Design worked on the restoration. Exterior of White Ave Studio, an event Space and photography studio at 2517 White Avenue in Berry Hill between I-65 and Franklin Road. Another one of Dryden’s projects, White Avenue Studio, offers up an unusual spot for celebrations. White Avenue is owned by Scott and Ashley Hylbert who bought the property four years ago when it was Barker Lounge, a doggy daycare, with plans to just use it as a photography studio with different options for backdrops. The Hylberts soon realized they knew the architect across the street, Dryden, and got him involved with the renovation from the beginning. Scott is a former account executive for music advertising at the Nashville Scene, and his wife, Ashley, is a photographer. They had been looking for an exit point from the weekly. Their first event was a wedding in 2015 and they are busy with weddings almost every Saturday now. “We’re doing a lot of rehearsal dinners, a lot of baby showers, year-round,” he says. “We’re doing a lot of fundraisers. For the holidays, a lot of corporate cocktail parties, holiday themed parties. Scott says their booking business has grown each year since they have been open, but this year has been off the charts, a combination of word of mouth and some marketing. Now, they are in the process of buying the neighboring property. “We’re acquiring it this month and we’ll expand at some point,” he adds. “We’re not sure how yet, but probably more like 2019, 2020 timeframe. Their current space can accommodate 125, without the outdoor space. With nice weather and some tents, the courtyards can easily be included for events with 200 guests. The front has a lounge, kitchen, seating area, bathroom, hair and makeup room, and an office. Then through a glass hallway, and up a few stairs, and you are in the main studio space, a 900-square foot, high-ceilinged, white space with lots of natural light flooding through the windows. The event space is busier than the photography studio rental, which Scott attributes to the sheer number of options for location shooting. “That to me is more saturated than the event space. And there’s just way more money in events.” An event at White Avenue starts at $3,750 for a Saturday night wedding, Fridays start about $2,500. And Thursdays, $1,500. Artist Ed Nash is also doing double duty, renting out his artist studio for private events. He moved into the East Nashville studio in 2009, and by 2010, he was hosting his first event in the work and gallery space, an open studio showcasing his own art. But since that first event he has rented out the space to people for everything from birthday parties to wine tastings. “It’s not like it’s always a very typical kind of event,” Nash says. Nash can accommodate 125 seated at his studio, depending on the configuration the party wants. Then, the layout is planned on a computer. And each year he is fielding more and more requests for events. “I’ve noticed that people are now booking out the next year earlier in this year,” he adds. He’s not booked up for this holiday season yet, but his own holiday party co-hosted with Style Blueprint is an annual event he always makes sure he gets on the books. Since it is a living, working studio gallery rather than a typically-empty event space, he can get creative with projectors and music and LED lights.